If you wish to purchase a color of Ankarsrum Mixer that we do not have in stock just contact us: we will have it delivered to your doorstep at no extra cost. The Ankarsrum Assistent Mixer 6230 includes: 7 1/8 quart stainless steel bowl, dough hook, dough roller, scrapper and spatula, clear plastic beater bowl, balloon and cookie whisks. 7 year warranty. Chrome front panel knobs, easy grip tension knob for arm. 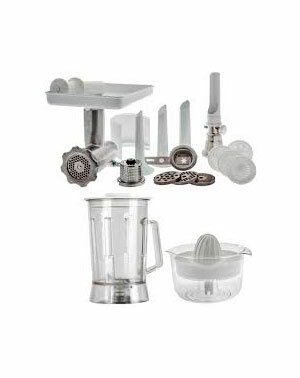 The Ankarsrum Assistent Mixer 6220 includes: 7 1/8 quart stainless steel bowl, dough hook, dough roller, scrapper and spatula, clear plastic beater bowl, balloon and cookie whisks. 5 year warranty and plastic knobs. years and that Ankarsrum Mfg has been around since the 1600’s! !